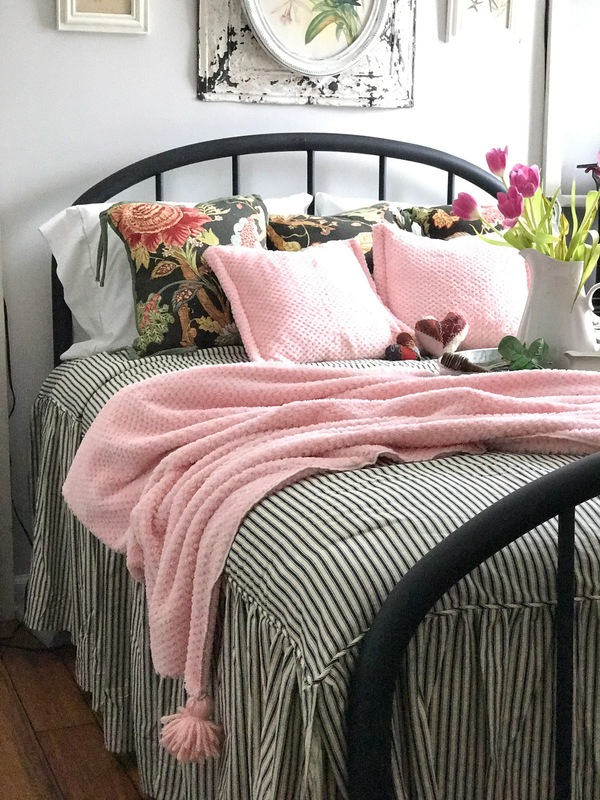 This year when I started looking for spring inspiration for my guest bedroom, I turned to the vintage bird prints that I inherited from my aunt. I had always loved the greens and pinks in these prints but was not currently using them. I decided to paint the frames with Old White Chalk Paint by Annie Sloan and hang them over the guest bed. I hung the prints over the bed, leaving the vintage ceiling tin in place. Seriously, not everything I use in my decor is vintage. The tray came from Walmart, but I filled it with some of my vintage pieces and it works. I had three accent pillows that I had previously used (in another home) in my breakfast area. I loved the shades of pink in them as well. So I decided to pull out the pink for spring. I found some fun fabric at Walmart and made the pillow covers and the throw. Instead of storing the pillows I already had on the bed, I just covered them with these new pillow covers. When I want to change the room again, I'll just remove the covers. I also purchased some coordinating yarn for the tassels on the throw. I love the mix here! Birds, florals, black, white, and pink all feel like spring to me. This complete refresh cost less than $12.00. When planning a change in your decor, start with what you already have and try to imagine using items in a different space. Think about items you are not using. I didn't think I wanted to use the bird prints in my farmhouse and now they are one of my favorite things. A little refresh with paint can be amazing for something that you think looks dated or out of style. Sometimes we loose sight of the beauty in what we already have because it's been used in the same space for so long. Take everything out of a room and then start adding back. It's amazing how that will open your mind to new possibilities. As the tulips began to fade, I replaced them with this cute bunny for Easter. Miss Bunny say's Hi and have fun decorating for spring and Easter. this wweb site, and post is truly fruitful for me, kesp up posting such content. this website. I am hoping to see the same high-grade blog poss by you in the future as well. It seems too complicated and extremely broaad forr me. try to gget the hang of it! I will right away graab your rss feed as I can't to find yoyr email subscription hyperlink or e-newsletter service. I alll the time emailed this webpage post page to all my friends, as if like to read it then my contacts wll too. I actually enjoyed reading it, you can be a greawt author. my blog not operating correctly in Explorer but lolks great in Opera.